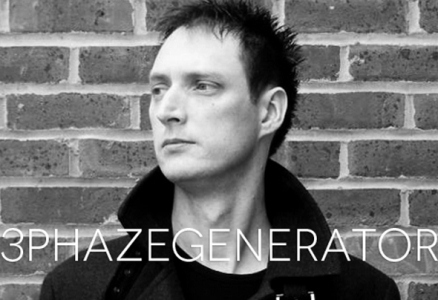 As one of the most exciting in a new breed of producers making an impact on the techno industry, 3Phazegenerator draws from a powerful collection of original material and heavyweight remixes. His unique cutting edge sound has made him in demand from labels across the globe. His dj sets have a living pulsing organic power and have earned him a loyal following beyond even the realms of techno. This 'art form' as he calls it embraces unusual and flowing textures with intricate dark pulsing rhythms that seem to run in thier own time yet are at once deeply comforting and hook the dance floor. Hailing from the UK his style has been blasting across Europe for the last 6 years. His presence as a performer has a reputation for inciting crowds giving a freshness that is always remembered. 3P: From my days in a rock band I dreamt of having full creative control of all the instruments so that my vision could be clearly translated. With the explosion of the acid house scene in the late eighties and affordable computer midi control this became possible.As more tunes from my early livesets found there way to vinyl djing became a col way to express the music. CGNY: What or who influences your music especially when it comes to making music? 3P: I am always captured by new textures strange techniques that shouldn't work yet weave a magic to the dancefloor.We are blessed to live in a time when there are so many new independent minded young producers emerging. So there is no shortage of inspiration out there right now! 3P: Dark and Funky with a twist! People love funk and drive in a tune but they also need that extra something to captivate thier imagination.That secret ingredient is something thats there in every tune and I always try to bring out this magic. When people party they want to be entertained and so I always bear this in mind when writing tunes. 3P: I've tried so many configurations and most solid for me is Allen & Heath Xone:DX using Serato Itch with a MacBook Pro. Itch just has a really clean sound and with a 96KHz output it gives a very detailed eq. The feel and responsive of the Xone is great! I can trust it in any club. Recent mix from Techno FM..